Wall Street Beat: 2013 IT Spending Forecasts Look Upbeat. If this is the case then an organisation with a $USD 100m IT spend is set to increase their capex by $3.3m this year and $6.1m next year. This represents almost $10m increase in capex in the next 2 years. I am not sure where they get these figures from? If we assume the standard wisdom that economies traditionally take 2 years to recover from recession and a further 2 years to return to trend growth then it will be 2017 before IT budgets hit 3.4% growth. Given the savage cuts in IT budgets after the recent recession(s) I think these figures are conservative. A further factor to consider is that the ICT industry is so highly segmented that generalised growth is meaningless. 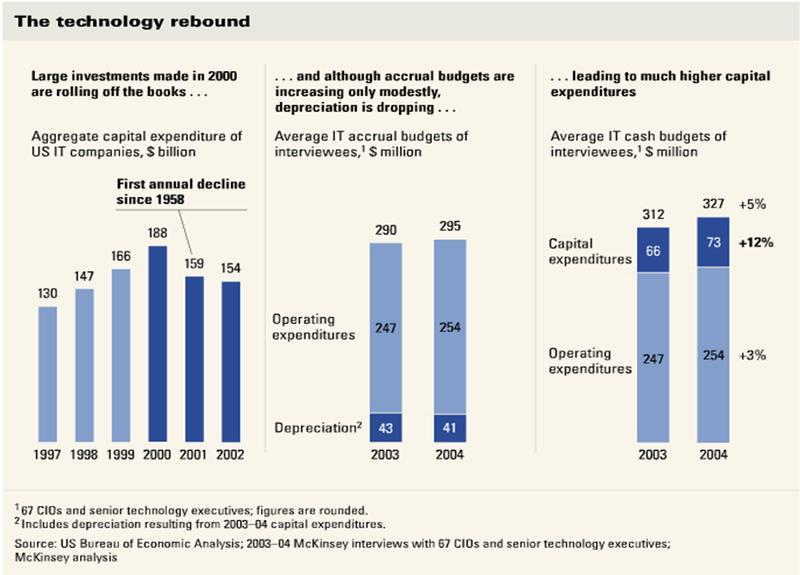 Looking at the finances of the tech rebound of 2003/3 (shown above in the Mckinsey & Co chart) we can see that – at the high end – IT capex of $73m accounts for 12% of the overall budget. At this rate, 6% growth equals a $36.5% growth in capex by 2015. This is, of course, nonsense. The moral of the story is: don’t look at reports of astonishing growth in the tech sector. Research has shown that the ICT sector is made up of so many tiny segments that even McKinsey’s figures are to be viewed with caution. In summ, the burst of the 2001 tech bubble saw IT budgets plummet roughly 70%. There are no reliable current fugures as to the general sum of cost cuts per sector in ICT budgets. However, if we count on 10-25% overall budget reductions then it will be well beyond 2017 before we see budgets returning to pre-2008 in real terms. If anything is certain, however, tech always surprises.